"Reconstruction of Marginal Mandibular Defects Utilizing Bone Marrow As" by Shachika Khanna, BDS, DMD, Rafael Gavilanes, DMD et al. 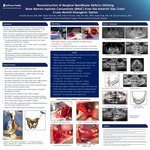 The aim of this case series, is to describe our surgical technique for reconstructing benign mandibular neoplasms using BMAC – a less invasive approach than traditional iliac crest bone graft harvest. BMAC was used in combination with mineralized freeze-dried allograft, platelet rich plasma (PRP) & bone morphogenic protein (rhBMP-2) to reconstruct the hard tissue lost secondary to the ablative tumor resection. 10 patients included in the retrospective case series were treated between 2014 and 2017 by 3 surgeons. Mean age - 44 years (range - 19 to 77 years). BMAC was obtained from the anterior iliac crest (AIC). When appropriate, a custom milled mandibular reconstruction plate was placed. Maxillofacial pathology included benign neoplasms such as Ameloblastoma, Cavernous Hemangioma, Central Giant Cell Granuloma (CGCG), Dentigerous Cyst & Keratocystic Odontogenic Tumor (KOT). Khanna, BDS, DMD, Shachika; Gavilanes, DMD, Rafael; Diecidue, DMD, MD, MBA, MSPH, Robert; Taub, DDS, MD, Daniel; and Flashburg, DMD, Alyssa, "Reconstruction of Marginal Mandibular Defects Utilizing Bone Marrow Aspirate Concentrate (BMAC) from the Anterior Iliac Crest: A Less Morbid Osteogenic Option" (2019). Department of Oral and Maxillofacial Surgery Posters. 2.